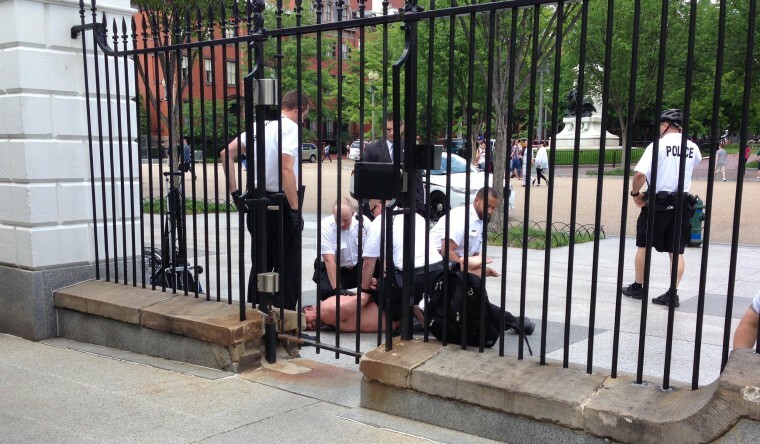 A man stripped naked in front of the White House on Friday afternoon, but was quickly covered up and subdued by officers, according to the Secret Service. The man, identified as Michel Bechard, took off all of his clothing in Lafayette Park after the officers denied his request to enter the property for a meeting, a Secret Service representative said. NBC News' Chuck Todd, who witnessed the commotion, reported that officers covered Bechard in "silver foil like blankets." Bechard suffered minor injuries while the officers tried to subdue him and was transported to the hospital, according to the Secret Service. Protesters frequently demonstrate in Lafayette Park, situated directly in front of the White House, but it wasn't clear whether Bechard was protesting. Charges are pending, the Secret Service representative said.